When your insured diamond jewelry has been lost, stolen, or damaged, you’ll want to find a diamond jeweler with the appropriate resources to replace your precious item. Anthony Louis Limited is a preferred jeweler for several insurance companies in Florida, including State Farm, Allstate, Travelers, Prudential, and more. These reputable companies put their trust and faith in Anthony Louis Ltd., Tampa’s premier diamond jeweler, and so can you. Plus, we have an impressive inventory of brilliant diamonds and an expert design staff who can replicate a piece that will exceed your expectations. 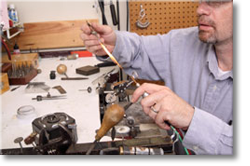 Anthony Louis Ltd. can even create a piece reminiscent of an old family heirloom, so no matter what type of jewelry you need replaced, you can depend on us. One of the most exciting aspects of our replacement services is that once we’ve created your replacement piece, you are welcome to shop with us for years to come, and are offered the same wholesale discounts on all of our merchandise. We like to call it our “preferred client list” and you are on it. Whether you need to replace the diamond in your engagement ring, or you’re shopping for the perfect anniversary ring to express your love and appreciation for that special person in your life, Anthony Louis Ltd is the best diamond jeweler for the job. If you’re looking for a reputable diamond jeweler for insurance replacement service or for custom diamond jewelry, contact Anthony Louis Ltd. today. We’re one of the select companies in the nation who are certified to provide this service, and are happy to assist customers in Tampa, Sarasota, Clearwater, and elsewhere in Florida.